When was the last time you felt tired, weary or overwhelmed? No this is not the beginning of a commercial for some new prescription medicine. Really, when was the last time you were just done with your day? What was it that led you to that? In life we pick up many heavy burdens, which at times can seem overwhelming. However, Christ is calling us to come to Him with our burdens and cast them there before His feet (1 Peter 5:7). This casting off of burdens is important and the first step in many things but there is also more to this. Consider the words of Jesus in Matthew 12:28-30. We cast our burdens at Christ’s feet so that we might exchange it for the yoke/burden He has prepared for us. A yoke was used for accomplishing the work of the field and so God has a yoke ready for us because He has an important work prepared specifically for each of us to do (Ephesians 2:10) but in order to take up God’s will for us we must first unload our current burdens. But how do we unload our heavy burdens and take up instead the easy and light burden of Christ? Take a moment to wander over to Psalm 119 with me, the longest chapter in the Bible. Specifically let’s examine verses 25-32. Notice the writer of this Psalm once dealt with a heavy burden just as you and I do but he knew how to deal with it. Look at what he said: “My soul cleaves to the dust,” and “My soul weeps because of grief.” The word translated “soul” here is the Hebrew word Nephesh which speaks of a person’s entire existence, that is, all that they are. So this psalmist’s entire existence is lacking and in sorrow (which we can relate too). However, this man knows how to respond when in such a dark place. Notice in these verses he makes six appeals to God from which we can learn how we should also pray when we feel crushed under life’s burdens. “Revive me according to Your word” v.25 –Ask God to be the one to revive you and grant you renewed life instead of trying to pull yourself up by your own bootstraps again. Recognize that God is going to have to be the one to make things work this time. “Teach me Your statutes” v.26 – Ask God to teach you His Word which contains His laws, His promises, His warnings and all that He desires us to know about Him and how to live this life. Recognize the need to know God and what He desires for you. “Make me understand the way of Your precepts”v.27 – Ask God to help you understand how to live out His Word in your life so that you can be “doers of the Word, and not merely hearers who delude themselves” (James 1:22). God desires us to live out His Word rather than just know about it. “Strengthen me according to Your Word” v.28 –Now that God’s Word is known and understood so it can be lived out ask God to be your source of strength and power so that you may be able to follow His word well. Our own strength is not enough and if we attempt this on our own we will fall short. “Remove the false way from me” v.29 – Ask God to help you choose His ways over your own will and that of the worlds. Even when we fully understand God’s way we can still choose our own desires and will for our lives instead of accepting Gods for us. Trust Him! His way is the best way. “Graciously grant me Your law” v.29 –Recognize that everything God provides for us is an act of grace (a gift we do not deserve). View His Word, Work and Way as a gift that should be treasured and thank Him for it. Notice the great desire for God’s Word, Work and Way in the psalmist’s life. All of his appeals can be tied back to those three things. This psalmist does not end with the six appeals to the Lord. No, the psalmist then takes the next step and gives six actions he has or will take in response to what God will do within him. “I have told of my ways” v.26 – The psalmist is in open communication with God through prayer. Take time to speak with God continuously about all things. Prayer helps us to maintain a proper focus and supply line to God as we walk in His ways. “I will meditate on Your wonders” v.27 –Take time to contemplate the work of God in and around you. Contemplate the wonders of His creation even within the smallest details of a leaf or a blade of grass (as we talked about several weeks ago in the Taking Time post, if you missed that one you can still view it on the website). Contemplate what He has done in the past recorded in His word or in your own life. “I have chosen the faithful way” v.30 –Purposefully choose every day to follow God’s way/plan rather than your own. This is not something we do once and are done with but rather something that must be done consistently and purposefully. Notice that God’s way is the “faithful way.” God is always faithful and we are called to the same. “I have placed your ordinances before me” v.30 – Once you have purposefully chosen God’s way place God’s word, which is our guide, before you so that you walk in His way in the way He wants you to. God is just as concerned about how we go through life as He is where we are going in life and so we should listen to His guidance. “I cling to your testimonies” v.31 – Choose to hold tightly to God’s guidance and don’t let it go so that it is not replaced or confused by our own wisdom or that of the worlds. If we release our grip on God’s word we will be led astray. “I shall run the way of your commandments”v.32 – Commit to keeping God’s desires for you recorded in His word. Choose to keep His commandments which help to protect us from evil and provide us with a pattern for godliness which produces an abundant and fulfilling life. We can learn from this psalmist that with every appeal we make to God we should respond with action. God is calling us to action! We also would do well to follow the progression of appeals and actions which the psalmist laid out. For each step builds upon the last. With these steps we can help ourselves to lay our burdens down before the Lord and then take up His good, easy and light burden instead. 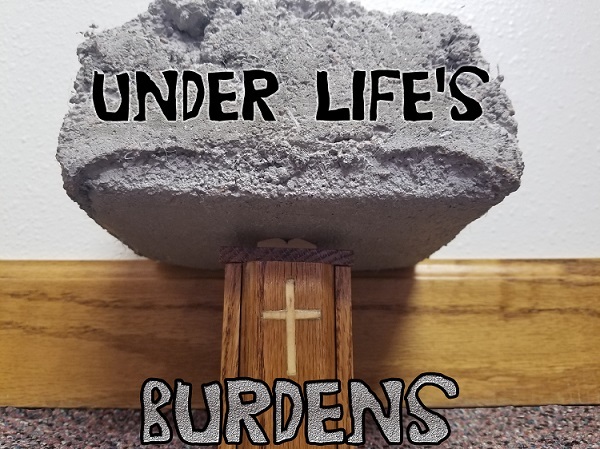 There is more we can learn from this psalmist about dealing with the burdens of life but we will save that for the next time this pulpit wanders. Until then take the time to review the six appeals and actions of the psalmist and how you can be purposeful in their application. Thank you so much for this. I needed to be reminded of who God is and all the Blessed He has given to me. Thank you again!